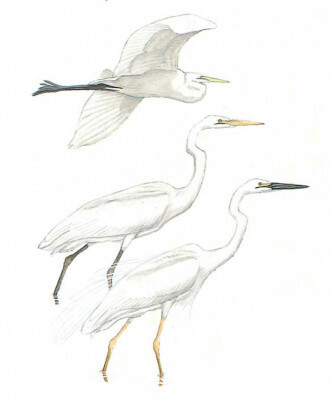 The largest white heron with long, angular neck often stretched to full extent. Adult in breeding plumage told by large size, scapular plumes, black bill with yellow base and black legs, yellowish above joint. In winter bill is yellow and lower legs blackish green or brownish. Sedate in flight and on the ground.